There is power in words. In the words, we speak and in the words, we write. As a writer, I spend many hours with pen and paper crafting sentences that I hope will have a positive impact on the reader; words that inspire them and moves them closer to realizing their dreams. But I also know that the words I write for myself need to have that same type of impact on me as well. This is a point that I believe captures the mindset of the award-winning, science fiction author Octavia E. Butler. The words she wrote about her future success mattered and were a catalyst for the realization of her dreams. I never knew about Butler until her name came up on my screen in an email I received. Intrigued by what I read, I continued to do some research on her life and her work. Butler was a pioneer in the field of science fiction not only because she was an African-American woman blazing trails in a field dominated by white males. But also, because she was an award-winning writer who created a new genre called Afro-Futurism, and was the first person to win the McArthur Genius Award in the field of science fiction. What really captured my attention about her writing life was not only her accomplishments but also the mindset in which she approached her craft. The image below is from Butler’s commonplace place book. It is her handwritten declaration of the vision she cast for herself as a writer. Butler wrote positive and specific intentions of what she wanted and expected from the writing life she was creating for herself. She wrote these words as if they were already happening. 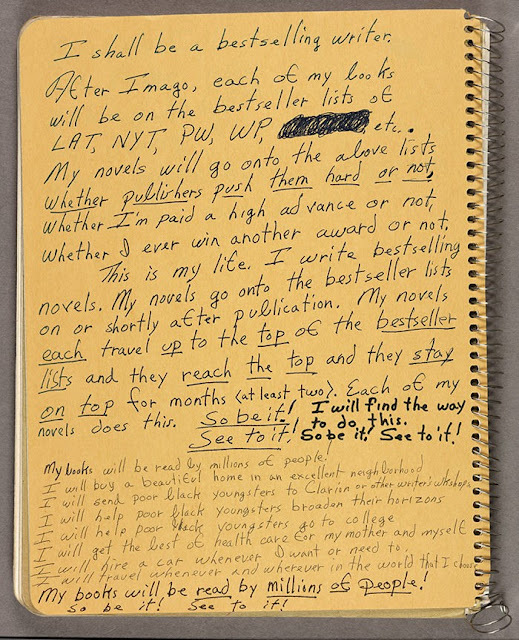 Butler used phrases such as “I shall be a best-selling author,” and “My books will be read by millions of people!” The conviction in what she wrote was clear. The focus and determination to have the life she envisioned; is written in a way that speaks to the power of belief in one’s self and abilities. Reading this from Butler’s personal notebook was inspiring and motivating for me. 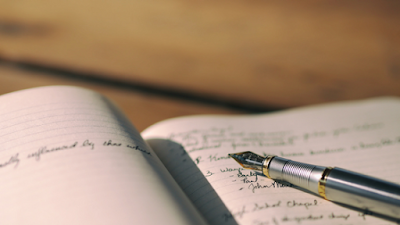 I began to re-think the declarations I had set for my writing and my life. Earlier this year I created a page in my Dream Makers journal about my intentions for the second year for wordsbytara.com. Looking over it again, I realized that I needed to make some changes and use powerful words that affirmed the dream given to me by God. I realized that I needed to put a little "Octavia E. Butler" in my writing and declare I am already the writer I see myself becoming. We have to not only speak but also write into existence the things we want for our lives. This is what Butler did. She envisioned her success, wrote it down and then did everything she needed to do to make it happen. Butler acted on her intentions. She kept a strict writing schedule and would rise in the early morning hours to work on her novels. Butler held a variety of jobs that allowed her the freedom to pursue her dream. She also took writing classes, was mentored by another successful author and always remained true to herself and her craft. Butler’s focus and determination led to the eventual success she had imagined years earlier. Butler ends her page of declarations with these two little sentences, “So be it!” “See to it!” These six words sum up what is foundational in making your dreams your reality. You have to name what it is you want and then do the necessary work to get it. We can not only speak powerful words. We can not only write powerful words. We also have to live out those powerful words. What powerful intentions have you made for your life and your dreams? Send me an email I would love to hear from you! Click here http://huntington.org/octaviabutler/e to read more about Octavia E. Butler. Sharing is a good thing! Share this with three people you know.